Click the Practice tab to schedule, view, edit, print, and cancel practices, and take attendance. You can also schedule practices in OnDeck Coaching Tools. When it comes to running your team, your first step is to schedule or add all your practices. We recommend doing this for your entire season up front, or what’s left of it if you started using Coaching Tools in the middle of it. This only determines when the various rosters will meet; a workout is what they will actually do during practice. This illustration is a good breakdown of each component. A Swim is the most basic unit of a workout, a single activity. For example, “3 x 100 @ 1:30 Freestyle” is a single swim. A Set is composed of one or more Swims and rests. A Workout is composed of one or more Sets. Practice contains one or more workouts. A common scenario is when you have two workouts in the same practice—one for distance swimmers, and one for sprint swimmers. We will explain the first three items in the Workouts section. For now, all you need to do is schedule your practices (the last item above) and then add workouts to them later. Click + Create Practice. Alternatively, if you are viewing the calendar in the Week or Month view, hover the cursor over an upcoming time slot with a practice and click +. Tip: A title such as Senior Group 2C won't fit in the Alias field, so change the Alias to something like SG2C so you can make sense of it in the Calendar. Select a Roster, Location andCourse. Note you can’t put two different rosters in the same practice, so you’ll need to create a separate practice for any rosters that meet at the same time. 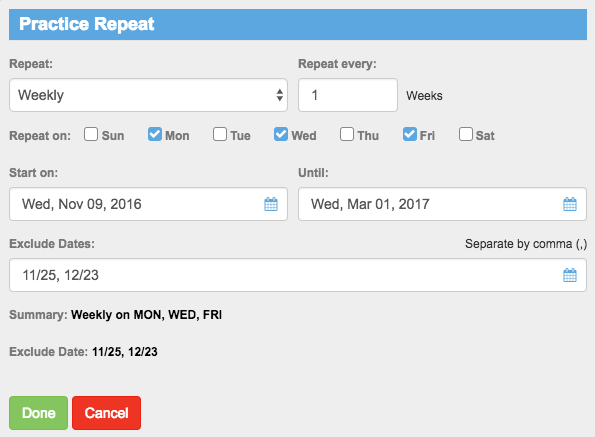 Check the Repeats box, then enter the frequency, days of the week, ending date, and any dates to exclude, such as holidays, and click Done. If the same coaches always run this practice, click Select Coaches, select them, Done. Otherwise, you can assign them later. Once you’ve scheduled your practices, you then need to add workouts to them, which we’ll cover in the next lessons. Mini calendar — Click a day to display that day’s practices in the Day view. The down arrow in the upper left hides/shows the mini calendar. Quick filters — In addition to the usual Customize Filters button for viewing multiple rosters and so on, there is a set of quick filters on the left to filter by all or a single coach, roster group and location. 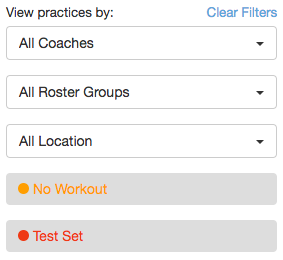 Click No Workout to see only those practices that don’t have any workouts attached, and Test Set to see only those practices that have workouts with test sets. Clear Filters resets them all. Time frame navigation — Click Today to jump to today’s date. The arrows move back and forward in the selected time frame (on the right), whether a day, week, or month at a time. Calendar view — Sets the number of practices to view. In all of them, click a practice name to view/edit it. Icons that appear to the right when you hover on a row to Print, Edit Workouts, Take Attendance, View or Cancel the practice. 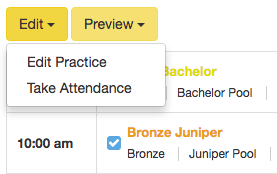 Select one or more practices, then click Edit to either Edit Practice or Take Attendance, or click Preview > Preview Practice. With the latter, you can view and print the Workout in Detail View or Whiteboard. Week — View all the workouts in a week. In both this and the Month view, hover the cursor over an upcoming time slot with a practice and click + to add a practice to that time slot. Month — View all the workouts in a month. On days with more practices than can be displayed, click the +x more link at the bottom to see all practices that day, and click a name to edit, or x to close. List — Based on the last selected view, displays all practices for that time frame. For example, if you had the Week view selected and click List, you will see all practices listed for that week. Click the calendar icon to the right of the time frame to change it. Click the + by a day to expand or collapse the view of practices within it. Now that your calendar has all your scheduled practices, let’s cover writing workouts.